you have the right implementation partner? You have the right technical solution, Do you have the right implementation partner? When you chose your new technology solution, you chose the right product to move your business forward. Selecting the right partner to implement it is equally important. Your partner needs to understand your business and have the capability to design and implement a solution that meets your strategic goals. Also, they have to be able to work with your people to ensure they are properly trained and supported so they’re confident when it’s time to go live. The Cloud team at AKA knows how to leverage Cloud technology to help you transform your business. We work with you to best understand your challenges and goals to put that technology to work for you. Effective and efficient, this technology breaks down barriers and smooths the way for your implementation. You don’t just get an IT provider, you get a solution provider. Every implementation is unique. Before anything else, we work with you to develop a firm understanding of your company’s culture as well as your challenges and goals. Why? Because this knowledge will help us determine how best to approach the implementation. The right approach—one that fits your culture as well as your needs—means the difference between a smooth implementation and a bumpy one. With Agile, work is delivered in short “sprints,” completing a predetermined set of deliverables after each sprint. 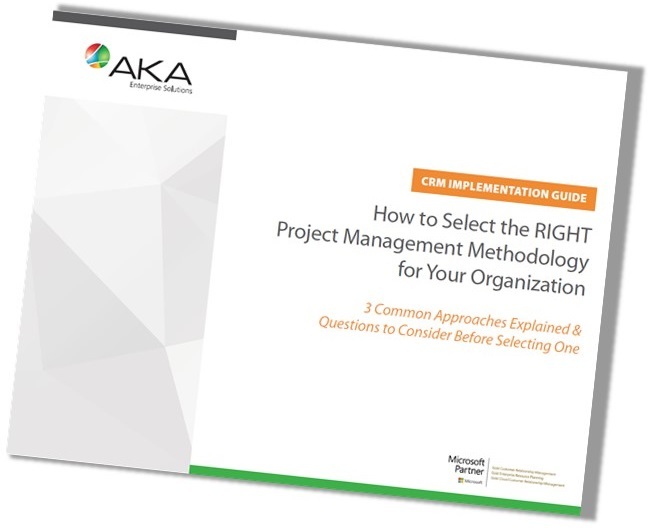 Using this approach, it becomes easier to identify gaps in requirements or requirements that may need to be altered due to technical or regulatory changes, which the project team can assess and modify in the next sprint. This more traditional approach follows a sequence of phases: Needs analysis, requirements gathering, design, development, testing, and implementation. Waterfall is more structured and, in some cases, may be required by certain organizations. We choose the implementation approach that will work best for your organization and individual solution. Sometimes we might even recommend a hybrid of the two approaches—whatever will get the job done most effectively. Our project management experts have extensive experience in both methodologies. Regardless of approach, you can be confident in our abilities. Your business solution must be a true asset. That defines how we work together. No matter how we manage the project, the goal is to put a solution in place that satisfies you.